Wordless Wednesday: Help it or eat it? | Go. Do. Be Dog. I don’t know, says Yaxley. It’s rolling around like it banged its big toe or something. And those noises! I can’t tell if the critter is laughing or saying naughty words in Dothraki. What should I do, Food Lady? Do I try to help it or maybe just eat the thing to end the suffering? 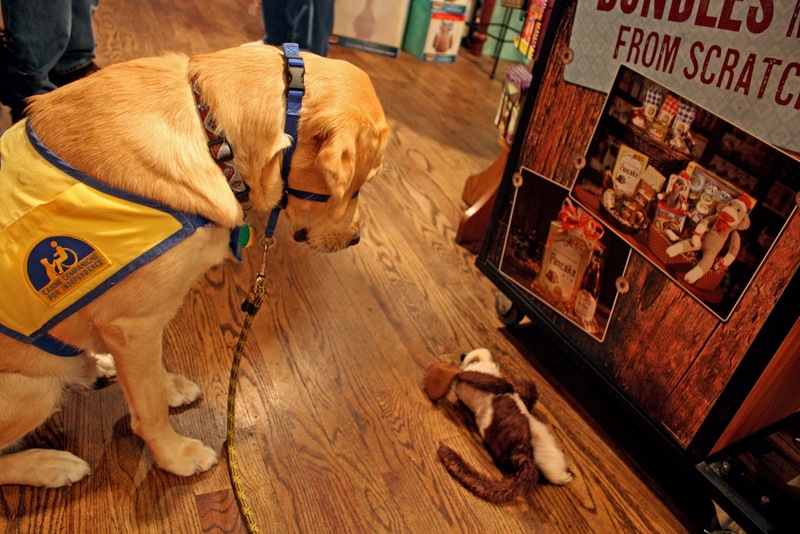 A never-before-published photo from the puppy raising archives has Yaxley observing a battery-operated toy in Cracker Barrel’s strategically placed gift shop. You know their floor plan, right? It’ll be a fifteen minute wait, says the hostess. Feel free to shop around until your table’s ready. Posted in Training, Wordless Wednesday, Yaxley. Bookmark the permalink.